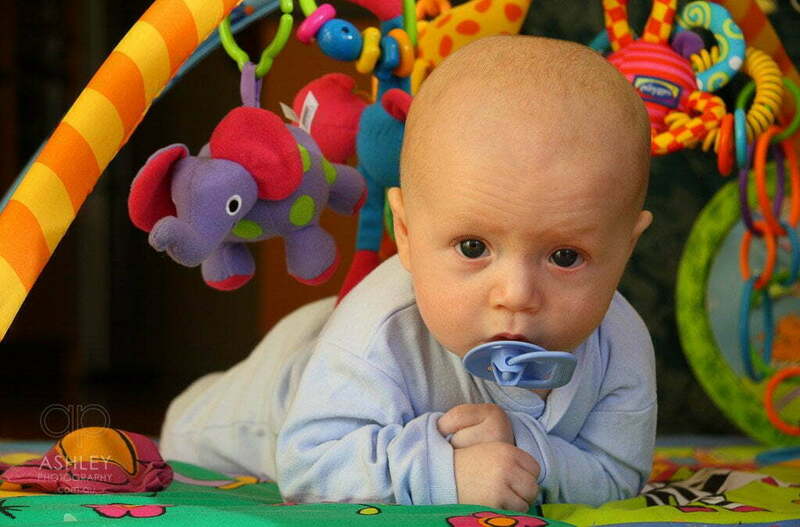 I can think of countless funny moments when I think about baby photography. Lenses covered in sticky fingers and dribble, toppling tripods complete with cameras, and urgent nappy changes to name a few. And all in pursuit of that decisive moment that captures a fleeting aspect of a tiny personality before the arrival of the next wonder week. Of course it’s all worth it, because those early years are so precious, and as those of us with older children know, the memories they create are so very special. Professional photography of babies is big business these days, and it can be hard to identify the good from the bad, or even the tasteful from the tasteless. The purpose of this article is to help you think about what you value in baby photos as a guide to choosing the right photographer, and taking better photos yourself. When talking to clients about baby photography, one topic that nearly always comes up is Anne Geddes. If you don’t know who she is then a quick google search will show you many photos of tiny babies lovingly squashed into the most unlikely places. Love them or hate them, these photos put professional baby photography on the map, and in their originality blurred the boundary between photography and art. What they show is the contrast of your baby to the world in which he or she lives, how small they are, how delicate, how fragile. When clients ask me for my opinion, I reply “yes, if that’s how you want to remember your baby”. For me, this is the key question – just how do you want to remember your baby? Over the years I’ve seen baby photography come and go from family walls and have noticed a pattern amongst the keepers, and that is that parents just can’t bear to part with images that capture their baby’s personality, their environment, or their relationship with family members. I love photo reportage because it allows me to capture real life. One of our missions here at Dygiphy is to make photo reportage available to everyone, and get rid of the artificial limitation created by per-print pricing business models. Photo reportage is a combination of photojournalism with portraiture, and is about “reporting” on what I see, and that lets me keep it real and create amazing memories that families will cherish for a lifetime. With baby photography, I like to capture the little moments that happen as part of the everyday routine. Just like any parent, I follow my clients’ babies around waiting for that special moment where a little nuance of personality combines with the right light and composition to create something beautiful through the lens. As a parent, I’d encourage you to do this too. Avoid missing everyday life by deciding today is the day to take a few photos, instead always have a camera ready so that when the magic moment arrives, you are primed to capture it. There are a few tricks you can employ as well to give your photos a professional edge, which I will discuss next. If you haven’t already read my article on How to Identify a Great Photo, I would recommend doing so. In it I discuss elements within a composition, and how they interact to create a narrative. Babies interact with people all the time with highly expressive, sometimes magical faces that are priceless for the photographer. To capture them properly you need to compose your shot to show both the baby and who or what they are interacting with. I always look for interaction when on a photo session, and if I can’t find any I create it. With children I will often ask them to show me their favourite toy. With babies, you can give them a toy, or maybe something to eat (the latter likely to create a funny moment!). Of course the greatest interaction with babies is with people, and this is never truer than with their parents. 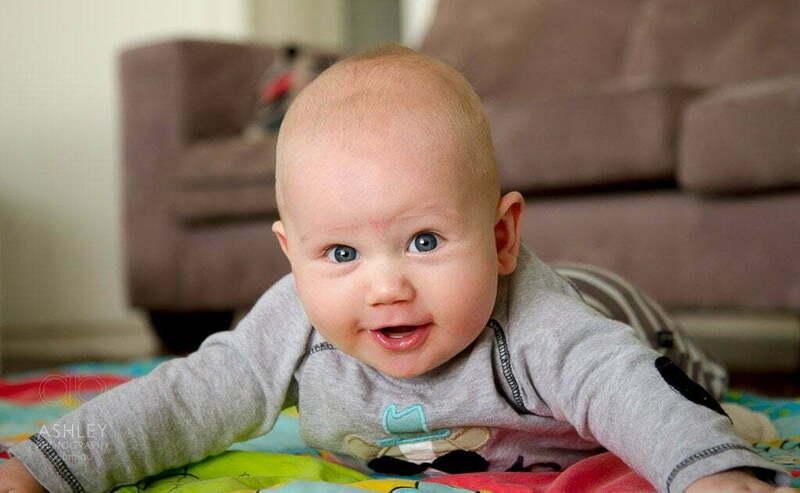 Babies particularly love faces, and will reach out to grab noses and hair, often accompanied by strong eye contact and smiles. This would have to be rule number one, and gets broken by nearly everyone. I even see professional photographers break this rule without good reason. Perhaps for the same reason we are told as parents to speak to a child at the child’s level, a photo will be more engaging when taken at the subjects eye level. This is easy when we take photos of someone as tall as ourselves, but for a newborn it means getting down flat on your stomach with the camera centimetres from the ground. When photographing families, I am always amazed by how much fitness is required, and this is the reason why. Up and down from prostrate, to knee, to standing hundreds of times per hour is quite a workout, but I know that will give me the best chance to capture an engaging shot. The only time I break this rule is if the angle I require to get the right background composition or lighting means I can’t get any lower. Also, look for the reflection of the window in your baby’s eyes. This can be a struggle with tiny newborns whose eyes spend more time closed than open, but once you can see it you know you have a good position from which to take a photo. This is called catch light, and professionals in studios work hard to recreate it artificially in the absence of a big window. That catchlight is going to add sparkle and life to your baby’s face, and it also tells you the light is falling in roughly the right place to illuminate your little subject in a flattering way. A fast lens is one that lets in a lot of light, and is the number 1 tool for shooting indoors or in low light situations. All lenses have a diaphragm that opens and closes to adjust the amount of light that can reach the camera sensor. This works on the same principle as the human eye, which has a pupil for the same purpose. When it is dark, your pupil will dilate to let in more light, and the same needs to happen with your camera. In lenses this is called the aperture, and the size of this aperture is one of the main things that differentiate professional from standard lenses. My advice to anyone who is serious about photographing children and babies, is to get themselves a fast standard zoom lens. The fast bit will mean the largest aperture is at least f/2.8 or larger (in lenses a larger aperture has a smaller number, e.g. f/1.8 is larger than f/2.8). The standard bit means the zoom range will be between 28mm and 70mm (or for a cropped format SLR camera something like 17-50). The lens is more important than the camera, and is the first thing to upgrade if you want to improve your photography. The other benefit of a fast lens is that you get a shallower depth of field, meaning only the part of your shot on which you focus will be sharp, and the rest will be softly out of focus (this is called the “bokeh”). A shallow depth of field will help you blur out those parts of your image that are distracting, and as for all busy parents with small babies there is likely to be a bit of clutter in frame somewhere that needs blurring out! Having moved down to eye level, stopped down your lens to f/2.8 so that only the in-focus part of your frame is sharp, and moved that window reflection into the baby’s eyes, it’s time to focus right on the eyes. This will probably mean you need to turn off the standard auto focus in your camera, and turn on spot auto focus. Most modern cameras have more than one focus point, especially phone based or compact cameras. Software in the camera then tries to guess where the focus point should be and focuses the lens. Unfortunately it almost never gets it right, even on professional cameras, and this is a bigger problem than ever with a small aperture. Spot autofocus is a feature where you choose which focus point the camera will use (usually the centre), and then you just need to put the spot over the closest eye, half press the shutter to let the camera autofocus, and re-compose while holding that button down to achieve your desired composition, then fully push the button to take the shot. So in summary, these are the essential ingredients to look for when assessing a professional photographer or trying to find that special shot yourself. As with any great photo, if it’s good, you will engage with it emotionally. 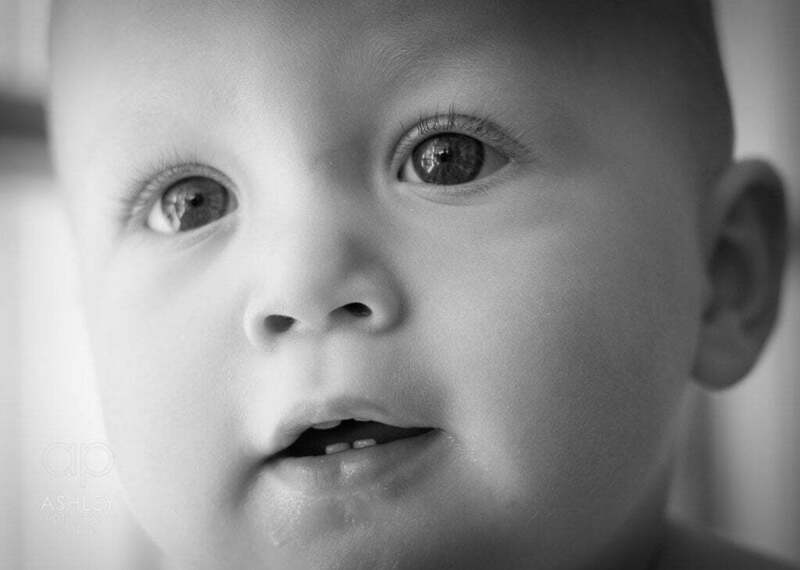 Great baby photography will leap out at you, make you smile, and be something you can easily relate to as a parent. In time, it will also become a memory that you will treasure forever.